Race to Dubai leader Tommy Fleetwood broke a 23-year-old course record at Carnoustie Golf Links to storm into a share of the halfway lead at the Alfred Dunhill Links Championship, joining the defending champion Tyrrell Hatton at the top. A nine-under-par 63 at the famously tough Angus links venue meant Fleetwood set a new record, bettering the 64 set by Scot Alan Tait back in 1994 which was subsequently matched by eight others. The 26-year-old from Southport, who became a father for the first time last week, moved to an 11-under-par tally of 133 as he chases a third European Tour title of the season. Hatton, meanwhile, is now 34 under par in his last six rounds at the unique pro-am event which takes place over three different famous links courses, having won for his first and only European Tour title last year with a score of 23 under. Fleetwood. Nicolas Colsaerts of Belgium was in outright second place on ten under after The 2012 Ryder Cup star carded a five under 67 at St Andrews Old Course, despite a double-bogey. Leading Scot is David Drysdale, pictured right, in joint sixth position, only three strokes off the lead after rounds of 69 and 67 for 136. Tommy Fleetwood: “It (Carnoustie course record) sounds good, doesn't it? You don't really think too much about it whilst you're playing, and to hole that one on the last for a course record, all in all, it was a good day's work, wasn't it! “Any time you have a course record, especially on a golf course like this, it's brilliant to have. I’m very proud at the moment. When I turned up this week, I hadn’t been practising whilst I was at home, so I had a week where I didn't do anything and that week feels like a year when you're in the middle of it. 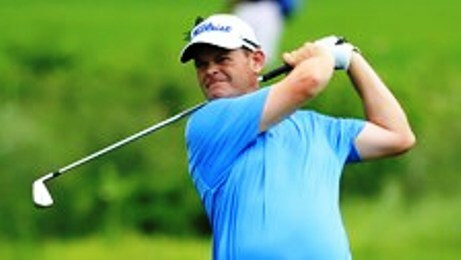 “I was pleasantly surprised when I come on the range on Tuesday. I hit it alright but yesterday, I played okay, but I really enjoyed being back in competition where every shot counts. Tyrrell Hatton: “I’m happy with today's round. I got lucky a couple of times, but obviously you need that. The putter came alive for me on the last 13 holes or so. It’s a really good day and very happy. “It's a strange feeling to think I've won the tournament, because when I look back, it doesn't feel like it was me that won. “Obviously it's great to be back and I have good memories from last year. I've come into this event with a bit of form. I'm happy that I'm carrying it on. Hopefully I can have a good one at Kingsbarns tomorrow, and it’ll be all to play for on Sunday. But there's still a lot of golf still to be played. Nicolas Colsaerts: “I played pretty well all day. I started off really good, didn't do any stupid stuff. I made one bad swing, one bad shot on the first, made double and bounced back right again just like I did yesterday. So I kept my momentum, which was good, and I rolled a few ones in on the front nine, which was my back nine. “But I had a good flow, even though it was getting really cold at the end. I think maybe I had a little bit of fortune with the wind because it kind of switched a little bit, and we didn't have the last nine into the wind as much as the guys had this morning. Paul Dunne: “I struggled through the first five but got it around at even par, and from the sixth I started to hit it well. I started to play the golf I've been playing over the last couple of weeks and it was pretty stress-free. Marcel Siem: “It's always a big goal to have a low round in St Andrews, such a special place. I'm really pleased to be up on the leaderboard. We’ll see what happens in the next few days.